Travel with Kevin and Ruth! : Barbados for two weeks? The price is not a screaming deal... however it is a deal nonetheless, and great deals from Ottawa to the Caribbean don't come up that often. Ottawa to Toronto, and then Toronto to Bridgetown. The problem with Barbados is that once you're there, it's not that cheap. Of course in true Kevin and Ruth style, we would find a way to make it work... we always do. And, I've already had a quick look at AirBnb and there are several relatively inexpensive options. Still, it would probably cost us about $350 per week in lodging, with meals and extras on top of that. Car rental are pricey, but public transport is plentiful and not that expensive. Looking at the airfare again, I'm leaning towards two and a half weeks. That would still get us back to Ottawa by November 9 or so and with loads of time to get through the U.S. to the Mexican border by the end of the year. There must be a hiking trail up to that peak! What do you think...? Anybody been to Barbados recently...? 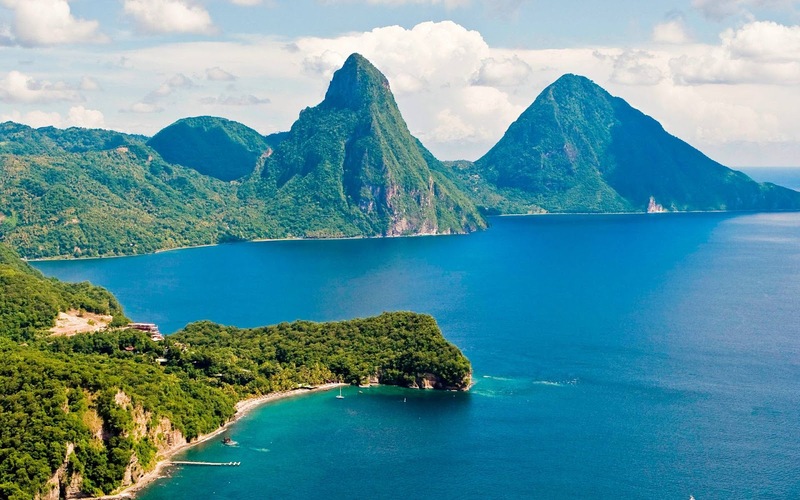 That picture is of the island of St Lucia which is North of Barbados. Those are the twin Pitons. You could fly up there from Bridgetown on LIAT or Caribbean Air. Ha! You are correct! We may have to take that short flight! OMG...do it! I have always wanted to visit Barbados and would eat up your posts, if you go. It sounds very reasonably priced to me. Crossing my fingers that you go! We have been looking at prices of things and yes it is more expensive than many of the places that we travel too but if we do a lot of our grocery shopping in the markets and make our own meals I think we will do fine. Looks like we can get around the island quite easily and cheaply with the public transportation and we always have our feet to get us around as well. It helps that we aren't having to pay a lot for our flight so the money we saved there will just go towards our living expenses there. We are really looking forward to it. We just booked it and will be going Sept 21 for one week - come and join us!! That is a screaming deal! Don't forget that $189USD is $250CAD for us, plus we have to still pay the taxes and fees to get us to Pittsburgh providing Air Canada has flights there. Whereas we are able to go to Barbados for $128CAD round trip each and we will get nice warm sunshine. :-) However, we are jealous that you are going to Iceland, we were there back in October 2012 for 5 days and loved it and wouldn't hesitate to return even though it is very expensive there. You will love it but dress warm is starts getting chilly there at that time of year and very windy, or at least for us it was. We would love to have joined you but I think we will enjoy Barbados. We will be due for some nice R&R after a busy summer. We have been to Barbados a few times and the bus system there is perfect for traveling about the island. No real need for a car.